January and February of each year, some of the world’s finest cruise ships travel through the ports of Los Angeles and San Diego as they begin their World Cruise Programs. These cruises range from 119 days to as much as 163 days, visiting exotic ports of call, carrying internationally known lecturers and experts of all kinds and circumnavigate the globe, ending in London, New York, Miami or Los Angeles. When these amazing ships and their worldly guests come through Los Angeles we try to get out and see them, as they are not on the West Coast of the US often. 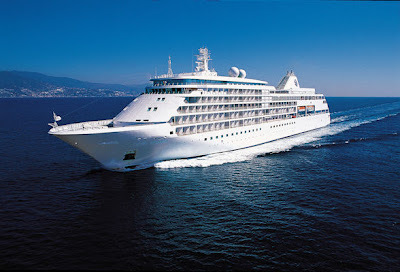 This last Superbowl Sunday (2010), while the Saints and the Colts where gearing up for battle in Miami, I was queued up in San Pedro, in the rain with about 30 other travel professionals for an exclusive and rare invitation to tour the Ultra-Luxury cruise ship, the Silver Shadow, part of the 6 ship fleet of Silversea Cruises. 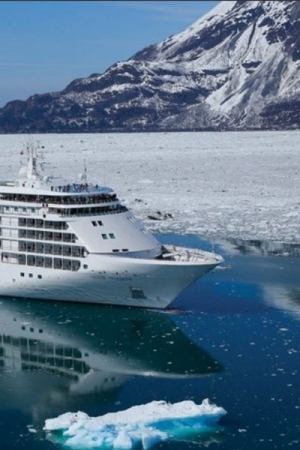 First of all, Silversea defies comparison to the rest of the mainstream cruise companies and ships. What I found in my afternoon on the Silver Shadow was a truly unique, luxury travel experience, and I will expand on that more shortly. Many of our clients are used to asking us about this ship and that ship and how they compare. We have used comparisons to hotels, such as ship A compared to ship B, would be similar to the difference between a city hotel like the Trump International in Chicago and the La Quinta Resort in the California desert and what all that means to the client. We have compared them like cars, this ship is for people that prefer a Mercedes, with a driver over a zippy BMW sportster. These comparisons help us get across the style, the “feel” of a ship and the level or service or care expected on a certain vessel. Silversea transcends this type of comparison in that it is not a floating resort or hotel at sea, it is a true luxury lifestyle experience. I found the ship extremely understated, but very elegant at the same time. The artwork is impressive and rare, but also simple and subtle. The dining venues are immaculate, well designed, beautiful, but again understated and comfortable. I walked away with the feeling that Silversea is for Travelers and Voyagers, not simply a vacation. Silversea is also an international company with approximately 50% of their guests coming from homes outside of North America. This makes for a very different and enriching travel experience. One afternoon you may be sitting by the pool with the winemaker from a vineyard in Argentina, then dining with a doctor from Ireland. This international mix adds to the overall travel experience, but also has Silversea offering more to their guests than found on other ships to accommodate the international crowd. Launched in 2000, the Silver Shadow only carries 382 guests in six-star personalised service, and all of them in ocean-view suites. I found the suites to be exceptionally well laid out and spacious, regardless of the room type. My favorites were the mid-range Silver and Medallion Suites ranging from 521 - 701 square feet plus a Veranda. Both of these had a nice sitting area, gorgeous italian marble bathrooms and a Glass wall enclosed bedroom area. These suites are designed for comfort and relaxation and I found them to be that, and so much more. Silversea is one of the only All-Inclusive cruise ships, that is really All-Inclusive! All Silversea Guests receive complimentary beverages throughout the ship and the cruise, including fine wine, spirits, bottled water and anything else you could desire. They also stock your in-suite mini-bar with your personal preferences prior to your boarding the ship. Silversea aims to make the experience seamless, with transfers into town included at most ports around the world, complimentary in-suite dining if you choose, an exclusive and complimentary shoreside event on most cruises and a butler at your service to help unpack, pack, assist with dining arrangements and anything you could ask for. I’ve posted pictures on our Legendary World Facebook Page - so become a FAN and check them out! If you have any questions about Silversea or Luxury Cruising, you know how to get ahold of us!